The myth of Atlantis goes back to the dialogues of Greek philosopher Plato, who told a legend of an advanced island civilization somewhere west of the Mediterranean Sea that went on a binge conquering European countries until it suddenly and mysteriously sunk into the sea some 11,000 years ago. The myth has been used a springboard for all kinds of utopian philosophers and contemporary science fiction writers, who have envisioned Atlantis as an enlightened society that fell victim to foreign invaders or natural calamity. With that kind of romantic history, it was only a matter of time before someone set about to recreate Atlantis for real. That journey began back in 1994 when hotel developer Saul Kerzer bought up several hotels owned by Merv Griffin on the sliver of Paradise Island, directly off Nassau, the capital of the Bahamas. There he set about creating a soaring new pink hotel surrounded by lagoons and aquariums filled with all kinds of exotic sea life, all set within the ruined palaces and courtyards of the supposed mythical city of Atlantis. 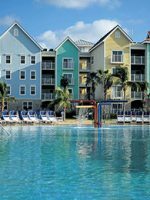 An elaborate water park, two more hotels, and a marina village all followed over the next few years, making the complex the top family vacation resort in the Caribbean and one of the most popular family theme parks in the world. The resort is less an evocation of a ruined ancient city than it is an unholy combination of Disney and Vegas perched on the azure blue of the Caribbean. The initial experience is nothing short of overwhelming, with a seemingly endless maze of hotels, beaches, pools, aquariums and waterslides all circling around the soaring trademark pink towers, connected by a bridge that forms the center of the resort. Once you get your bearings, however, it’s easy to literally find something for every age group and interest, from thrilling inner tube roller coasters to elaborate kiddie pools; from casual outdoor eateries to restaurants helmed by some of the world’s best-known celebrity chefs (Nobu, Jean-Gorges and Bobby Flay among them); from adults-only casinos and nightclubs to one of the best kids’ programs anywhere in the world. To orient yourself in the resort, it’s best to think of it as an interconnected line of five hotels with the marina in the middle — from north to south, the resort starts with the Beach Tower and Coral Towers, the original hotels on the property; next comes the Royal Towers, the iconic main hotel; and the marina with its Harborside Village timeshares and shops. Finally, in the last two years the resort has dramatically expanded with two entirely new hotels, The Cove and The Reef, designed to appeal to more sophisticated clientele. Along with the newest hotels came an entirely new water park complex in which the various slides and pools are all connected by a river raft system allowing visitors young and old to explore the attractions without ever leaving the water. Other highlights include a dolphin park where guests can literally swim with dolphins; a shark tank where they can walk among sharks with the help of a trained diver; and the recreation of the partially submerged city of Atlantis at the core of the resort, transformed into an 11-million gallon fish tank filled with giant manta rays, groupers, and other impressive giant fish. Of course, despite the endless variety and excitement of the resort, it does have its drawbacks. For one thing, for a resort that is so much about the ocean, the real thing is hardly to be seen — the layout of Atlantis is all focused inward, on the hotels and pools, with few good ocean views aside from the hotel rooms and irregular beach access. Also, apart from the exceptional central Atlantis exhibit, the theme of the resort is irregularly applied, with some parts looking like any other Caribbean resort, and some elements, such as the Mayan Temple, seemingly tacked on without any real thought to cultural integration (a breezy explanation that the Mayans were thought to be related to the Atlanteans fails to convince). More practically, this is not a cheap vacation — room rates are hefty at any time of year, and food is especially expensive, with few low-priced options on the resort itself and no easy way to venture off-property to find cheaper options. (Families on a budget, however, can opt to stay in a kitchenette at the Reef, choose the lower-priced Beach Tower or Coral Towers, or book a room at the Comfort Suites off Marina Village, which grants access to all Atlantis attractions.) There is also a fair amount of nickel-and-diming that takes place, such as charges for the fitness center and kids programs that are included at other resorts, and eye-popping extra charges for activities such as swimming with dolphins and sharks. Even so, the overall experience of Atlantis is so unique, it’s literally not one you will find anywhere else in the world. If you can set aside a hefty budget for the trip and not think about money, this is an once-in-a-lifetime vacation many families remember as one of their best vacations ever. 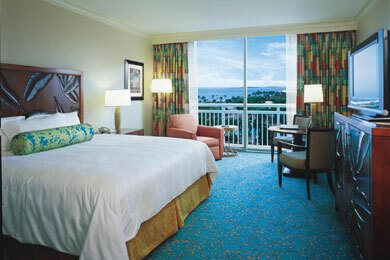 Atlantis offers a range of accommodations in an attempt to appeal to any family, interest -- and some extent budget. In general, all of the rooms are kept up extremely well -- while they couldn't be called luxury accommodations (with the exception of the Reef and the Cove), all are solid mid-range rooms, with renovations occurring every several years. The majority of rooms at the resort are in the Royal Towers, which offers the most central location as well as the most flexibility with room types, including several different sizes of suites and the ability to combine adjoining rooms. These hotels offer similar types of rooms to Royal Towers, though slightly smaller and removed from the center of the action. On average, the Coral Towers rooms tend to be $100 less than Royal Towers, and Beach Tower rooms tend to be $150 to $200 less. The Beach Tower, in particular, lends itself to those seeking a little more peace and quiet, while the Coral Towers offers the best beach access for those looking to sun themselves by the ocean instead of the pool. On the other side of Royal Towers, the new Cove Atlantis strives to appeal to a younger, more fashionable set with more luxurious accommodations and a South Beach vibe. Rooms are larger, with more amenities, and the hotel itself includes its own adults-only lounge and casino. Despite this, children are still welcomed with open arms, and access to the water park is easy. Next door to the Cove, the Reef offers a similar vibe, with an emphasis on luxury if not trendiness. All accommodations here are timeshare apartments that owners rent out to guests. They all include refrigerators and kitchenettes, making self-cooking an option for a family on a budget. Consisting of timeshare apartments with individual entrances, this collection of rooms is made to look like an imitation Bahamanian village. The apartments are only open to guests when the rest of the resort is entirely sold out. For those looking to buy, however, they offer a somewhat quieter, more neighborhood-y feel, which still granting access to the rest of the resort. All rooms include a coffee maker, iron/ironing board, hair dryer, and safe. Kids 11 and under stay free and cots and cribs are available at no extra charge. In case you're wondering about the Bridge Suite that connects the two original towers, it features one king suite and one queen suite with a large living and dining area and private casino, as well as private butler and chef available 24/7. The suite comes with a hefty price tag: $25,000/night. 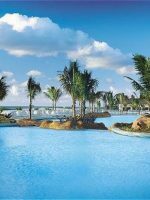 For families on a very tight budget, meanwhile, Comfort Suites Paradise Island also abuts the property; while not formally part of the Atlantis resort, it does offer complete access to all Atlantis attractions. Note: All activities and attractions are available when staying at any of the six Atlantis hotels. Most kids big and small will want to make a beeline for the waterslides. There are two interconnected water parks at Atlantis -- the Mayan Temple complex next to the Royal Towers, and the Power Tower near The Cove hotel. The two are connected by the Lazy River and The Current, a river rafting ride combining both peaceful stretches and exciting rapids. The water park is 141 acres but the kids will most likely spend most of their time at the 120-foot Power Tower with the Abyss body slide, which is a 50-foot near-vertical drop in the dark through a 200-foot-long tunnel. Interspersed between the waterslide complexes are several kids' pools, including the Splashers kids' pool, an area with several kid-sized waterslides on the backside of the Mayan Temple, and two zero-entry pools with shallow areas perfect for youngest kids. In addition, there are several other pool areas in the other hotel areas, including the Poseidon kids pool at the Beach Tower, and the lagoon next to Royal Towers that has paddleboats and other watercraft for rent. 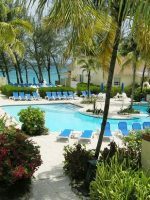 Cascades Family Pool is exclusive to guests of The Reef and The Cove. The best beaches at the resort, meanwhile, are off Coral Towers. 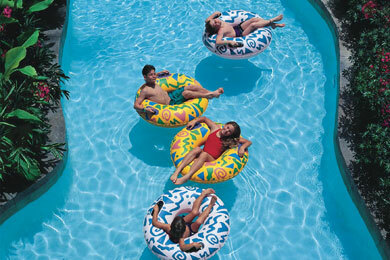 Apart from the water activities, kids have many other options for fun. Each hotel has its own unique aquarium, from the Ruins Lagoon at the Royal Towers, to the Predator Lagoon at Beach Tower, and the sea turtle river at Coral Towers. The main aquarium, however, is The Dig, where archeological Atlantis treasures are immersed in a marine habitat to create a feeling of discovering the lost city. The Ruins Lagoon is the largest outdoor marine habitat in the world with more than 20,000 marine life. The main kids' club, Atlantis Kids Adventures, or AKA, is located in the center of Royal Towers, and includes both onsite programs such as culinary programs and a Rock Band stage and field trips to other parts of the resort. Kids are divided into two age groups: 3 to 5 and 6 to 9. The club costs $45 for a morning or afternoon session, and all-day will cost $90 plus $17.50 for lunch. It's open 9 a.m. to 10:30 p.m., with Culinary Adventures offered from 9 a.m. to noon or 2 to 4 p.m. For rainy days, the Beach Tower also has a movie theater showing complimentary family movies day and night. In addition, the resort has two clubs catering to older kids -- Club Rush, which features both videogames and dancing for pre-teens, and the brand new Club Crush for teens, decked out with the latest video games and touch-screen entertainment. Club Rush is open to children 9 to 13 from 7 to 11 p.m., offering Wii, PS3, Xbox, dancing and a live DJ. For the teens, the nightclub was created at the tune of $11.8 million and provides a family session from 5 to 8 p.m. where parents can see what the teens get to do when mom and dad are away. Which is plenty! The nightclub -- better than most adult nightclubs -- features a dance floor, Internet lounge, gaming stadium and cafe and "bar." Security cards are everywhere and staff works hard to maintain a friendly, safe environment for the teens who can party from 8:30 p.m. to 1 a.m. for $20. 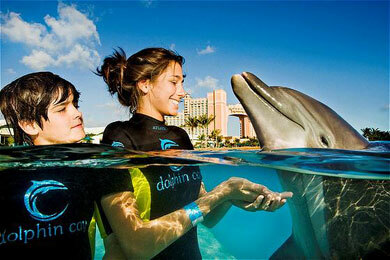 One of the most popular attractions at Atlantis is Dolphin Cay, home to bottlenose dolphins and sea lions. The 14-acre facility allows families to wade in waist-deep water to experience a Shallow Water interaction of glide alongside the dolphins in the Deep Water Swim. Backstage tours introduce kids to sea lions. 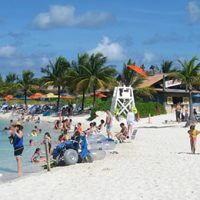 The Cay has a private beach, access of which is available by purchased day pass. 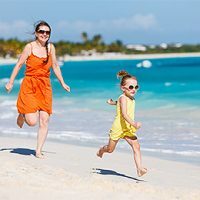 While it's easy to spend an entire week at the resort itself, families should also consider getting off Paradise Island for activities during the time of their stay. One of the best options for an excursion is Ardastra Gardens & Zoo, a small but interactive zoo with a jaguar exhibit, trained flamingo shows, and popular parrot feedings in which young kids can hold apples while Amazon parrots perch on their hands (and heads) and nibble away. Another fun excursion off resort is the pirate museum. Kids can explore below-decks on a recreated pirate galleon as well as exhibits on Blackbeard and other famous swashbucklers. In addition, Atlantis can also coordinate off-site adventures such as deep-sea fishing, snorkeling and diving -- or you can find private companies in Nassau such as Chubasco Charters (Harbour View Marina) or Lyford Lure Yacht Charter (Lyford Cay Marina) for fishing, and Stuart's Cove Dive Bahamas (South West Bay Road) for dive trips. Atlantis offers one-of-a-kind adventures at the resort, including a Sea Lion Experience where kids can go face to face with a California sea lion. Snorkel the Ruins of Atlantis alongside the lagoon's sharks, rays and tropical fish in another adventure. A new Stingray Experience brings kids hands-on with more than 100 stingrays, feeding, petting and swimming with the graceful creatures. Another new program is the Ultimate Trainer for a Day, a non-stop, seven-hour day with the professional animal trainers and marine specialists, feeding, training, caring for and interacting with the marine animals. All are at an additional fee. A state-of-the-art rock climbing facility located within the water park provides 12 different climbing challenges in one-on-one or group sessions. Children must be 6 or older to participate. Atlantis' own version of Build-a-Bear, kids can select from a variety of stuffed animals and style it in clothing and accessories before an official adoption takes place for kids to take home their new pal. Located in the Beach Tower. Located in the Beach Tower kids can paint their own pottery or fuse their own glasswork in the Atlantis pottery studio, lead by trained artists. During the slower summer season, Atlantis keeps things exciting with special "fantasy camps" for kids ages 7 to 11 to learn a variety of skills in a fun environment. They might include Kids Culinary Adventure, in which kids learn how to cook dishes culminating in their own birthday cake; LEGO Fantasy Camp, where kids learn how to build incredible large-scale LEGO structures, including of course Atlantis LEGOS; and Dallas Cowboys Cheerleader Fantasy Camp (stop what you are thinking, Dad), in which kids learn how to follow cheers and choreographed cheerleading routines directly from the masters of the trade. Teens and pre-teens are able to partake in special treatments at Mandara Spa starting at age 9 (parents must accompany kids under 18). Treatments range from "beach babe hair" to "acne attack facial," and parents and teens can undergo treatments together in special dual treatment rooms. Family dining is present throughout the resort with more than 20 separate eating establishments, it's not difficult to find something for every taste and appetite. Anyone staying at any of the resort's six properties may choose to dine in these restaurants. Best restaurants for smaller children are the buffet-style Marketplace (Royal Towers) and Mosaic (The Cove), where they can pick from dozens of different options and follow it up with a substantial dessert buffet. A similar buffet style experience is available at Seagrapes at Harborside Village. Nearby Marina Village also has a handful of family dining options, including retro burger joint Johnny Rockets, family-style Italian restaurant Carmine's, and casual Murray's Deli. Older kids or those with more adventurous palates will enjoy Bimini Road, a fun, tropical-themed eatery. Kids are also allowed for early seating at the more upscale restaurants such as Bobby Flay's Mesa Grill and French-Caribbean Cafe Martinique. Guests should definitely consider signing onto one of the resort's dining plans, as a la carte and even buffet prices could quickly add up. (A meal at Mosaic, for example, is $60 for adults.) 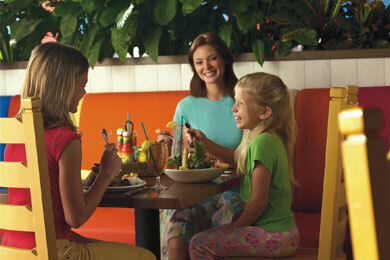 Atlantis currently offers two dining plans. The Value Dining Plan ($50/adult, $25/child) includes breakfast and dinner at Seagrapes and Marketplace only (though a new BBQ joint opening in summer 2011 will also be added for dinner). The Atlantis Dining Plan ($95/adult, $35/day child) will include breakfast and dinner at any of the resort's restaurants with the exception of Cafe Martinique, Nobu, Seafire Steakhouse, Courtyard Terrace, and Dune. For families on the dining plan, kids under 7 eat for free; for families not on the plan, kids under 3 eat for free. Babysitting can be arranged through the resort -- for a price. Sitters are $20/hour for one child, $8 each additional child up until 10 p.m. and $25/hour, $10 each additional child after 10. There is a three-hour minimum. Unless your child has special needs or you are planning on staying out after 10:30, it probably makes more sense to put the kids in the Kids Club instead, where not only will they be well cared for and entertained. Wifi Internet access is available in public areas and rooms for $19.95/day, with discounts for multiple days. For those rooms without washer/dryer, the resort also offers laundry service every day except Sunday. Atlantis is not an all-inclusive resort and parents should be prepared to shell out more than they bargained for, as everything costs extra. Want to snorkel for an hour? That will be $10 per person. Need a bottle of water? That will be $5. Crush will cost teens $20 for the night, and families who want to attend the family session will pay $15 for the first person, $25 for the second, and $35 for the third. Snorkeling in the lagoon may sound fun, and it will cost you $125 per person. AKA kids' club charges $45 for a morning or afternoon session, $90 for a full day, and $17.50 for lunch. Atlantis is located in a sub-tropical climate, similar to that of Florida. So it doesn't see the year-round hot temperatures that more Caribbean locations enjoy; however, it has does have a pleasant climate year-round, with over 300 days of sun annually. You are most apt to see rain during the wet season, between June and November, which is also when you'll see the highest temperatures, averaging between 70 and 90 degrees Fahrenheit. The only time you are risking a real rainout is during "hurricane season," between late August and early November, when sporadic hurricanes do occur. Temperatures during the dry season, between December and May average between 60 and 80 degrees, with less chance of rain. Atlantis drops its rates slightly during spring when demand is lower, and you can sometimes find bargains on room rates. Truth be told, however, this is a popular destination year-round, so don't go expect to find real cut-rate deals. Thankfully, the sheer size of the resort ensures that it never feels crowded, even when hotels are at capacity. The only exception to this is lines at the most popular waterslides, which are likely to be long at any time of year. Visit early in the morning or at the end of the day -- especially at the Mayan Temple -- for your best chances of a quick ride. Even though its slides are arguably better, the Power Tower tends to be less crowded than the Mayan Temple. The closest airport to Atlantis is Nassau International Airport (NAS), which is approximately a 45-minute drive from the resort. 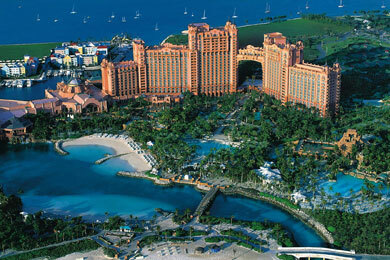 (Note: when booking, be sure to select Nassau, and not Grand Bahamas, which is 150 miles away!) Transportation to the airport can be arranged through the resort for a charge of approximately $100 each way; it's more economical to hire a taxi, which costs about $40 each way. Once at the resort, complimentary shuttle services is offered between the various properties, with waits of never more than half an hour, and frequently less. Despite Atlantis's reputation as a family resort, there are many perks that adults will enjoy without their children. Chief among them is the Atlantis Casino, which is open only to guests over 18 years old, and offers 90 table games and almost 900 slot machines in a high-energy setting. The casino is anchored by two amazing sculptures of twisted glass, called the Temple of the Sun and Temple of the Moon respectively, each of which cost $1 million. Interestingly, the casino is the only one in the world that allows natural light onto the gaming floor; it's a strange experience to be playing slots or blackjack while light is streaming in the window, but Atlantis officials insist that it does nothing to dampen business. Less exciting, though certainly more relaxing, Mandara Spa is a Balinese-style spa with heated plunge pool and sauna, and a range of treatments including Swedish, sports, and reflexology massages, facials and seaweed wraps, and salon services. Treatments combine Eastern and Western techniques, sometimes incorporating local Bahamanian products. In addition to more upscale restaurants for date-night (Cafe Martinique, Nobu, Mesa Grill top the list), Atlantis also offers an adult-only nightclub, Club Aura, located above the casino; and Joker's Wild Comedy Club, an intimate club featuring top comedians located between the Beach and Coral Towers. 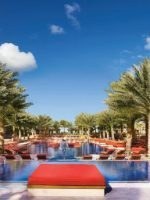 Guests of The Cove also enjoy access to Cain at the Cove, an adults-only Miami-style pool lounge, complete with cabanas and poolside casino tables, which are open 9 a.m. to 6 p.m. during high season. The Cove also has a separate (and somewhat smoky) indoor lounge called Seaglass that sometimes also has casino tables in operation in the evenings.